Whether you own one classic car or several, it’s a shame when the garage they’re stored in isn’t as sleek and impressive as they are. Flooring contributes significantly to the look of any room, and the high-quality yet affordable Pro Grip solution is the ultimate way to get that look right. Even if you choose a flooring system that looks excellent, you haven’t made the right choice unless it’s manufactured to a high standard of quality. A garage floor goes through a lot. It needs to be slip and stain resistant, hold up to a lot of weight and friction, and it even needs to insulate well. If you seek out a lower-quality floor to save a few bucks, that low quality will end up costing you more in maintenance down the line. The thing we love about Pro Grip is that the cost-to-quality ratio is exactly where it should be: balanced between affordable and reliable. Another quality of the Pro Grip flooring system that our clients appreciate is how easy it is to install. Some flooring solutions require you to use tools and assemble them through a lengthy and difficult process, or even hire someone else to assemble for you. Pro Grip tiles are carefully designed to lock into place without the use of tools or glue, and their locking system holds up to high amounts of pressure just as well as the surface of the tiles themselves. Instead of spending excessive time or money on installation, you can get your floor into place and get back to storing and working on your vehicles. Of course, while looks aren’t everything, they’re a pretty significant factor in your process of deciding on a floor for your garage. As a modular flooring system that comes in a variety of colours and patterns, Pro Grip allows you to sharpen the look of your garage in exactly the way that you want. If you have a particular taste in paint job style that is expressed in the vehicles you own, there’s no better way to complement this sense of style with a coordinated choice in floor tile designs. Don’t settle for anything less than quality, ease of use, and flexibility! What kind of flooring do you imagine for your garage? With Pro Grip, the look, feel, and quality you’re after is well within reach at a price that doesn’t break the bank. 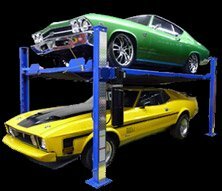 Give the team at Lift King a call at (403) 283-1020 and we’d be happy to set you up with a custom solution today!